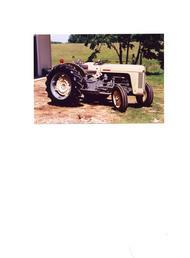 This tractor as you see it was owned and restored by Dave and Dusty Webster of Mitchell, Indiana. He has since sold it. However, it is quite rare cuz of the beige tin. The M-H-F people ownly painted the 35 tin beige in 1957.The same as the F-40. The 1955/56 35's were green castings and grey tin. The 57's were grey castings, red badges and beige tin. In 1958 the M-H-F people switched to the 'one tractor, one color scheme' ie, red tin and grey castings. In 58 they started selling all their tractors as MF's except the Ferguson TO-35 which was sold as a Ferguson until about 1960 even though it was red and grey. In 1961 the Ferguson became a MF-35 and fell in line with the rest of the MF family. Enjoy this photo cuz you won't see many like it. A special thanks to Dave and Dusty Webster for sharing it with us! !